At the church of St Alphonsus, North Ormesby, Middlesbrough. St Stephen's Day 10.00am Sung Mass in the Usus Antiquior. In addition, Fr Charlton will be celebrating a Sung Mass with carols in the Novus Ordo at 7pm on Christmas Eve and a Low Mass in the Novus Ordo at 8am on Christmas Day. I've been asked by Fr Bill Charlton to publicise his Extraordinary Form Christmas Services, which I'm more than happy to do. They include the *only* Solemn High Mass, in this part of the country that I'm aware of. Solemn High Mass is a rare treat, even during the year, so to have one at Christmas is an opportunity not to be missed! If you live in the North of the Diocese, and/or reasonable travelling time from North Ormesby, than I urge you to go to what will be a very special Mass. Here's the complete schedule, including his Ordinary Form Masses, should you be unable to get to Midnight Mass. Christmas Services. St Alphonsus' Church, North Ormesby. Fr Brown offering a votive Mass of the Blessed Virgin Mary, with Fr de Malleray as deacon and Fr Cahill as sub-deacon. Although not the best of photographs, these pictures may give some idea what went on at Ushaw 2009. 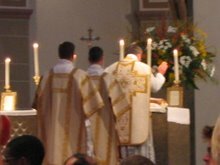 Information is spreading around the blogosphere about the next priest's training conference to be organised by the Latin Mass Society. It will be held at Ushaw College, near Durham, from 12th to 16th April is in Low Week. Further information can be found on the LMS website or on Fr Blake's or Fr Finigan's blogs amongst other places. The point that I would like to make is that we need to get priests to attend. There are many priests who would like to attend one of these conferences, but never get to hear about them. There are others who may get to hear about them, but need a little encouragement to attend. It may be that they do not know what to expect, or that they think that it will be too difficult or that their Latin is not good enough, or that they fear criticism from other clergy. My response is that they need fear none of these things. The Latin Mass Society has already held four of these conferences and over 100 priests have attended. The vast majority have gone on to be regular celebrants of the usus antiquior. Some have come back to a second or third conference to improve their skills. The conferences are streamed to cater for all levels of ability, ranging from complete beginners to regular attenders. Knowledge of Latin is also taken into account, and many priests have attended who have never studied Latin before. 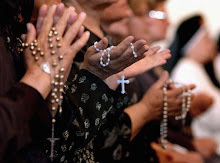 I would urge readers to spend some time thinking whether they know any priests who might benefit from attending the conference, and then to encourage them to attend. Apart from what they might learn about the older form of the Mass, they will certainly benefit from the excellent liturgies, the spiritual atmosphere and the friendship of other priests.